The perimeter is the outside line that makes up the shape. In a circle, the length of the perimeter is called the circumference. The radius is the distance from the center of a circle to the perimeter. The diameter is 2 times the radius. The volume of a box is length x width x height. Example: A box that is 3 m long by 2 m wide by 4 m high has a volume of 3 x 2 x 4 = 24 cubic m.
The volume of a cylinder is (Pi)r2h where r is the radius of the cylinder and h is the height. Example: A cylinder with a radius of 4 and height of 6 has a volume of Pi x 16 x 6 = 301.5929 rounding to 4 decimals. The volume of a pyramid with a square base of length L and height h is L2h/3. Example: A pyramid with a square base of length 4 and height of 9 has a volume of 16(9)/3 = 48. The volume of a cone is (Pi)r2h/3. Essentially it uses the formula for the volume of a cylinder and divides it by 3. Example: If a cone has a radius of 4 and height of 6, its volume is 75.3982/3 = 25.1327. The volume of a sphere is (4/3)(Pi)r3. Example: A sphere with a radius of 4 has a volume of (4/3)(Pi)(64) = 268.0826. 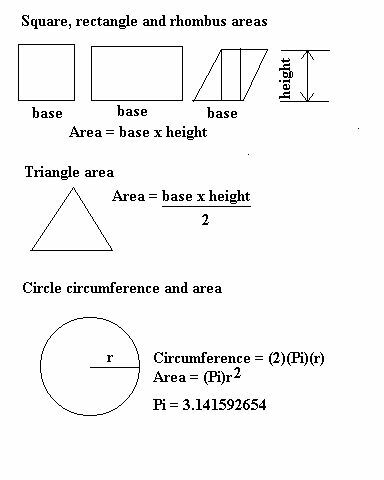 To get the surface area of a box, cube or pyramid, compute the area of each side and add them up. The surface area of a cylinder is 2(Pi)rh where r is the radius of the cylinder and h is the height. Example: A cylinder with a radius of 4 and height of 6 has a surface area of 2 x Pi x 4 x 6 = 150.7964 rounding to 4 decimals. The surface area of a sphere is 4(Pi)r2. Example: A sphere with a radius of 4 has a surface area of 4(Pi)(16) = 201.0619.